While the first use of this term is generally attributed to the great folks at ITSMA, few have unfolded the ideas and experiences that have paved the road to the point we're at today. List-Based Marketing - outside of branding and field marketing initiatives, a lot of B2B marketing was focused on tactics designed to reach and engage specific companies. The list was often a cross organizational decision and sales people were assigned accounts. From a marketing perspective, tactics tended to include things like direct mail, appointment setting services and telemarketing. The concepts of buyers existed but the scope was much more narrow, as the decision process tended to be much more narrow. Everyone tried to identify and engage with the economic buyer. If current need existed, the economic buyer would meet with the sales rep for the "dog and pony show" demo. Lead-Based Marketing - as marketing automation became adopted, the marketing approach shifted to optimize scale and efficiency at acquiring any leads and nurturing them to a point of sales readiness. Targeting and identification of audience needs took the back seat to cost per lead and "qualified" lead flow. Functionally, we gave up audience intimacy to scale the quantity of messages. Not to argue against the need for nurturing but the concept of trading away insight has left far too many marketers lacking even a modest understanding of what marketing actually means... as a basis point for this opinion, the AMA describes the starting point of marketing as identifying and delivering on the needs of a target audience. Account-Based Marketing - assuming that everyone agrees that an ABM program focuses sales and marketing efforts on a defined list of target accounts, the foundation of performance, of revenue impact, in an ABM rests in its ability to identify needs within each target account, develop some form of a plan at each, identify content that addresses the needs and achieves the plan direction, and can orchestrate engagement based upon those things. This is actually an amazing quote from the founder of Yesler. Over dinner he described their organizations content-centric approach to ABM. I couldn't agree more. The key takeaway is that scale is meaningless without insights. Without insights you can't properly align content. Without account-based insights your marketing has nothing more to offer than volume. In our last round of ABM Research, we found that this outside-in view of marketing is a key driver of revenue impact. 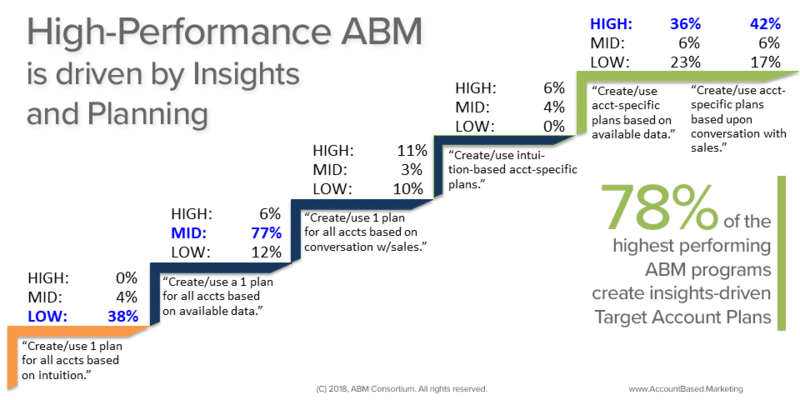 Not everyone has the capacity to plan at the account level, but don't treat your ABM program as a top/down campaign and expect that you'll achieve an increase in pipeline velocity or drive revenue. You won't. Our research proves that. In our "what is account based marketing" section, we take a look at this point. Likely the most critical point in adopting an ABM strategy, selecting target accounts, every other capability and media investment is dependent upon your accuracy in selecting great targets.